Delicious Corned Beef Dinner. A very easy recipe for stove top, oven or slow cooker, you choose! Delicious Corned Beef Dinner. This is a wonderful easy recipe and perfect for St Patrick’s Day or in fact any time! 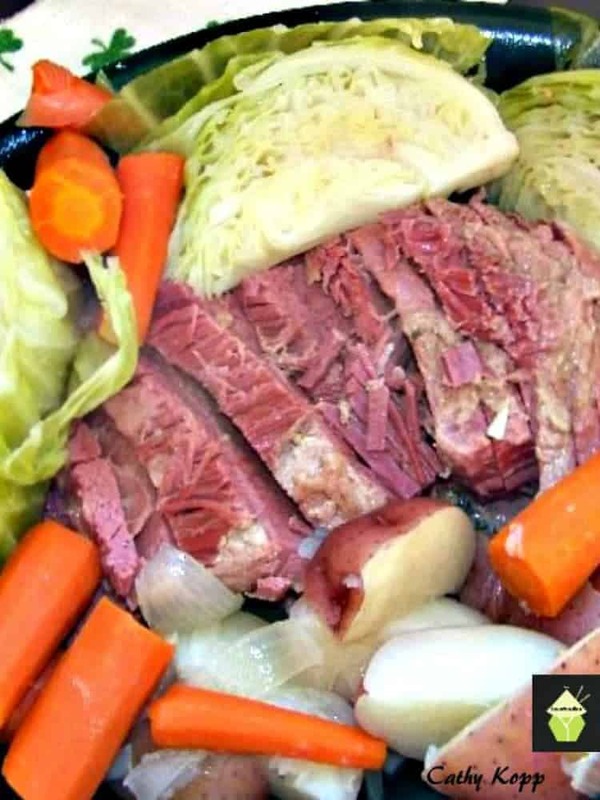 It’s always a very popular recipe and with very little effort, you can have a lovely corned beef dinner fit for your dinner table. For this recipe, we’ve given instructions for you to prepare the corned beef dinner on the stove top, slow cooker or oven. So you decide whichever suits you. Just be sure to follow the cook times for which way you decide to cook your corned beef. Everything goes in the same pot so that’s always an advantage as there’s less fuss and not so much washing up to do! All the flavors combine whilst cooking and the aroma is just delicious! If you’d like to make Cathy’s lovely Colcannon recipe to go with your corned beef dinner, you can find it here. Yield: 4 – 6 persons. 1. For stove top, in a large pan, cover Corned Beef brisket with water and add spice packet. Bring to a boil and then simmer for 2 1/2 to 3 hours until the internal temp reaches 160F. 2. With 15 minutes remaining, add to the pot 1 small onion, 6 medium carrots, and three potatoes (cut in halves). Cover and simmer 15 minutes. 3. Remove meat only to warm platter and cover. 4. Add 1 cabbage (cut into quarters) to the other vegetables in pot and simmer uncovered for 15 minutes. 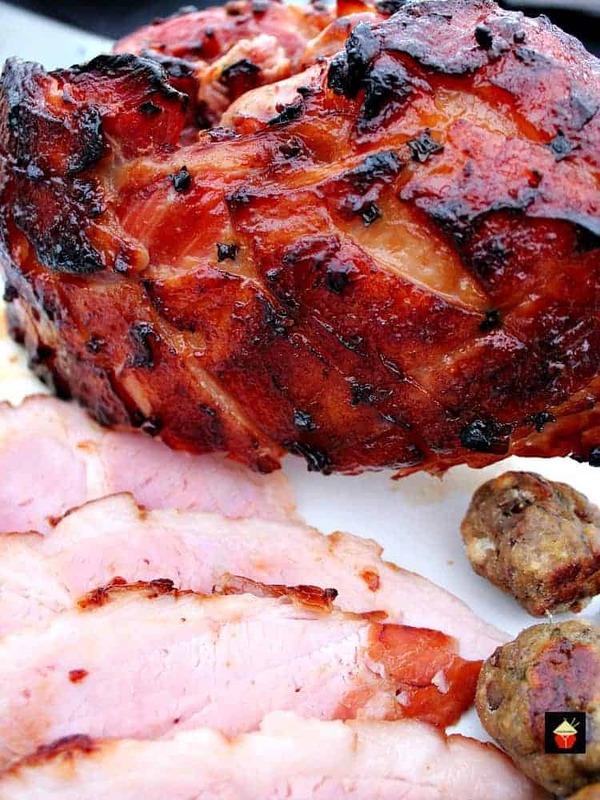 Remove corned beef from package and place on rack in roasting pan with 1″ of water. Cover pan and seal with foil to trap moisture. Cook in oven at 275°F for 2 hours 45 minutes or until firmly fork tender (160°F). Remove meat from oven and let stand 5 – 10 minutes. Slice thinly across the grain and serve. Remove corned beef from package and place in crock pot and completely cover with water. Cover and cook for approximately 11 hours on low or 5 hours on high, or until firmly fork tender (160°F). Please note that crock pot cooking times may vary greatly depending upon style. It is important to check the meat with a meat thermometer to ensure it has reached at least 160°F and is firmly fork tender. For best results, monitor at regular intervals. Slice thinly across the grain. Remove corned beef from package and place in pressure cooker with 4 cups of water. Cook 25 – 30 minutes at full pressure. Bring pressure down; add vegetables; bring to full pressure and cook 15 additional minutes, or until firmly fork tender (160°F). Remove meat from pressure cooker and let stand 5 – 10 minutes. Slice across the grain. Remove corned beef from package and score meat diagonally. Spread on favorite barbecue sauce. Wrap in tin foil, fat side up. Grill on low or indirect heat for 20 – 30 minutes per pound, or until firmly fork tender. Remove from foil and brown for 15 minutes. Cook instructions above advised by Grobbel. 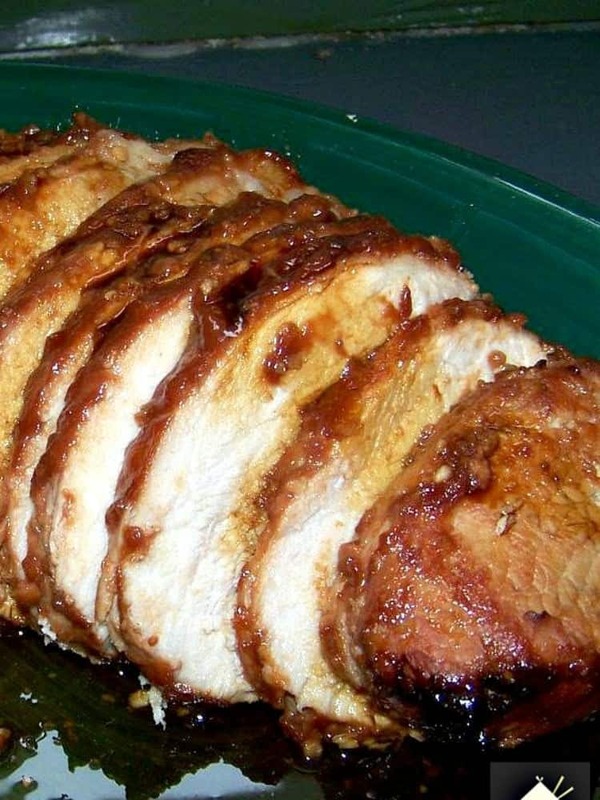 Here are a few more delicious dinner ideas for you to enjoy! Got some Irish Cream left over? 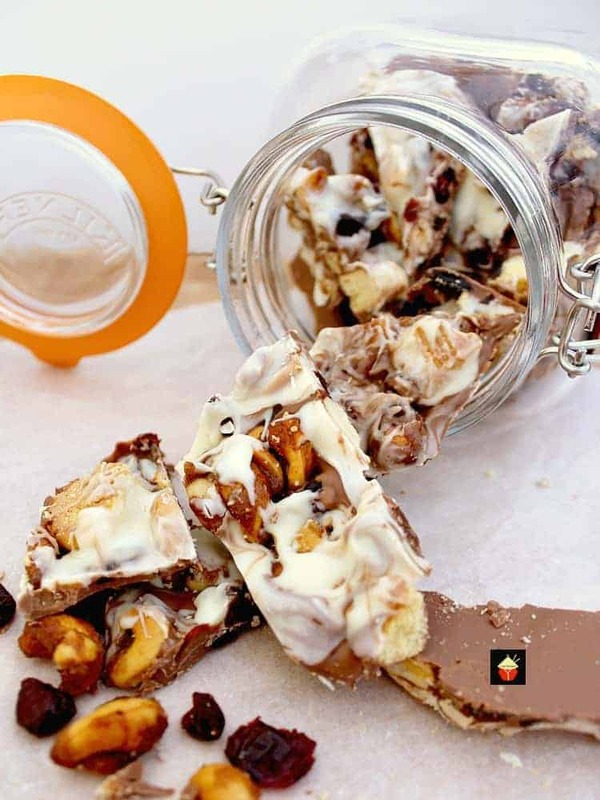 Make some of our delicious Irish Cream Chocolate Bark. Great as a snack or to give as gifts! For stove top, in a large pan, cover Corned Beef brisket with water and add spice packet. Bring to a boil and then simmer for 2 1/2 to 3 hours until the internal temp reaches 160F. With 15 minutes remaining, add to the pot 1 small onion, 6 medium carrots, and three potatoes (cut in halves). Cover and simmer 15 minutes. Remove meat only to warm platter and cover. Add 1 cabbage (cut into quarters) to the other vegetables in pot and simmer uncovered for 15 minutes. Why is my corn beef stringy aftercooked? And how can I make corn beef sandwiches ? I plan on doing the oven preparation method. When would you recommend adding the vegetables during the cooking process? Hi Lindsie, depending on the thickness you cut the veg, if it’s as per the directions then I would suggest adding them half way through the cool time. Hope that helps! Wwoooah! Karen! That sounds really tasty! Please enjoy and send me over some too. Hungry now!! This was delicious. I did leave out the mustard as I am allergic to all things from the mustard family, but a little splash of sriracha sauce gives it some spice like the mustard would. 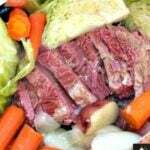 Thank you for the recipe as most call for already corned beef which has mustard in the brine! Now I can have it when ever I want. Thanks for writing in! So glad we were able to give you a nice recipe without the mustard! I love the sound of adding the sriracha for a little heat. Great idea!! Oh, Mary! It might be time to revisit the corned beef dinner! Yum! Yes Cathy! It’s proving to be very popular right now. Perhaps many are going to make it for Thanksgiving. They sure will enjoy it! Thanks as always for sharing your family recipes so everyone can enjoy them too!